In this article post, I’ll describe the differences in the many UV bulbs and why most UV Bulbs purchased at a low price are simply a waste of your money. If your goal is level one or higher UV sterilization for your aquarium or pond, a cheap bulb will NOT work, which is why often purchasing on Amazon or eBay is folly since most UV sold there-in are medium pressure UV lamps NOT capable of level one or higher UV Sterilization, ONLY clarification!!!! The two most common categories for aquarium or pond UV sterilizer/clarifier used are “Compact” and “Straight Tube (Standard)” UV bulbs. The compacts are a used by many popular UV Sterilizers such as the Sunsun Terminator, the Tetra, the Turbo Twist, the Jebo and many others. As well, most pressurized pond filters have UVs which use a compact bulb too. These are used in UVs which take less space than conventional UV sterilizers. Unfortunately, the UV Sterilizers that often employ the compact bulb often have many less than efficient designs and often the compact UV bulb is the bulb of choice by many low end UVs that have poor electrical components. The does not mean all in this category are poor designs. The SunSun and Tetra are reliable, while the Turbo Twist used to be OK, but newer incarnations use VERY low quality ballasts and should be avoided. The Straight tube UVs have been around for some time and their most basic design tend to be more efficient than Compacts, but there is wide variance in these as well. 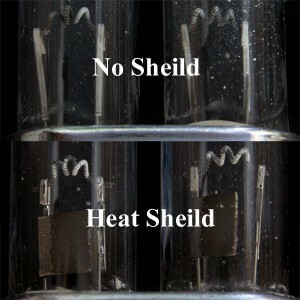 Many lower end Straight Tube UVs have poor UV wall designs which do not allow for maximum contact or dwell time. 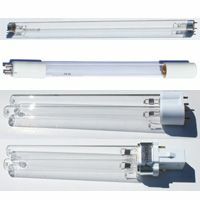 As well, poor ballast transformer/ballast quality is common among UV Sterilizers employing straight tube UV bulbs too. Examples of this poor quality are Lifeguard, Pondmaster Submersible UVs, AquaTop, and others that sell for under $50 (although the Lifeguard is not cheap, just overpriced in my view). However, it’s also the straight tube UVs that have the best, highest dwell time. GX23- these too are a two pin base, but have two clips instead of one clip to hold the lamp in place. G11- these are a four pin base with the four electrical contacts (pins) in a straight row. G7- a newer version of the 4 pin G11 used for smaller lamps, currently only a 9 watt UV bulb uses this configuration. G24- these are a newer more proprietary UV Bulb that uses a four pin base in a square configuration. Along with this, they have different lamp designs such as the “U” shape in the 18 Watt G24 and the Twist Shape in the 36 Watt G24. As for the design of these lamps, these are a less efficient design which do not allow for as much exposure time of the UVC. T5 2 pin- this is simply a measurement of the width of a straight UV lamps width of 5/8 inch along with how many pins are at the end of the lamp/bulb. The most common T5 2 pins are the 4 Watt G4T5, 8 Watt G8T5, & 16 Watt G16T5. T5 4 pin- this again is a 5/8 inch wide lamp/bulb, but instead has four pins at one end of the lamps bulb. Of the T5 4 pin UV Bulbs, the most common are the 8 Watt #PUVLF208, 10 Watt #GPH212T5L/4P, 15 Watt #GPH287T5L, 20 Watt #PUVLF350, 25 Watt #PUVLF46H, 50 Watt #PUVLF46H, & 57 Watt #PUVLF43H UV Bulbs. 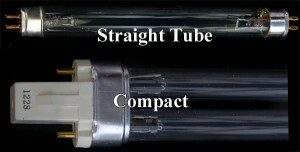 T8 2 pin- this is a 1 inch wide (width) straight tube UV Bulb that has 2 pins on each end. This is a “work horse” UV bulb used by many of the best UVs and some of the older standards in UVC sterilization in the past. Most importantly when looking for a replacement UV Bulb or even a new UV sterilizer is how the lamp is designed to work. This can greatly impacts results. Simply put, the goal of a UV Bulb when used for aquarium or pond applications, is to produce UVC irradiation. However, many UV bulbs produced today are a medium pressure UV bulb which might last longer, but also only produce 7- 15% UVC irradiation. The better UV Bulbs (which also generally sell for more) use low pressure mercury UV Bulbs/lamps that produce from 35- 95% UVC irradiation. Generally speaking, a low pressure UV bulb is 7 times more effective than a medium pressure UV Bulb. So with this in mind, your so called great price of $10 or less for a bulb you found on eBay or Amazon.com is NOT such a great deal when considering this UV lamp likely AT BEST might help with some clarification. It MOST CERTAINLY will NOT produce Level One Sterilization!! As well a patented version of the low pressure UV bulb is available that uses a heat shield that further increases UVC efficiency and thus output. 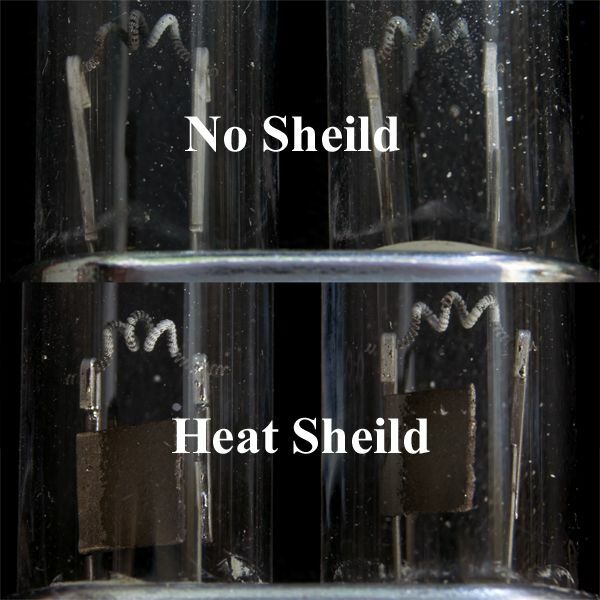 In summary, even if you do not purchase a UV Bulb with a heat shield (or cannot due to availability in your UV bulb size), do yourself and your fish a favor, and do NOT be “penny wise and pound foolish”. Don’t purchase a low cost medium pressure UV bulb, otherwise some clarification abilities is the best you can expect from your UV Sterilizer!